Eleanor & Park by Rainbow Rowell. Grades 8+ St. Martin's Press, February 2013. 320 pages. Reviewed from egalley provided by NetGalley. It all began on Eleanor's first day at her new school. It began with a bus ride. Anyone who's ridden the bus to school knows that it's a battle ground. It's early and dark and no one wants to give up a seat to themselves. Park was the only one who would move over, so that's where Eleanor sat. Park wasn't even sure why he did it. It's not because Eleanor was pretty, with those weird clothes and frizzy red hair. But it started something. Pretty soon Eleanor was reading his comics over his shoulder when she thought he wouldn't notice. And pretty soon they were both enjoying the same music, Park making mix tapes for her. And pretty soon they were inseparable. But everyone knows that teenage love doesn't last... or does it? Eleanor & Park is a high stakes love story. Reading it was remembering what it was like to fall in love for the first time, that desperate need to be together, that feeling that somehow this was all going to get taken away the moment you let your guard down. 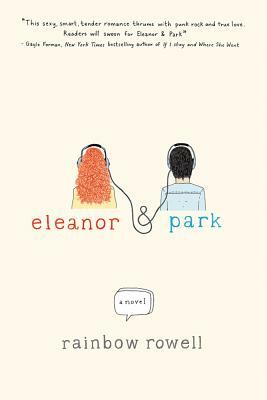 And for Eleanor & Park, there's a lot at stake here, as Rainbow Rowell builds up to a gradual reveal that all is NOT well in Eleanor's world. I don't want to spoil anything, but I'll just say that I think the plot builds on itself really well. The reader gets a sense of what's coming, but that doesn't make it anticlimactic. We see both Park's and Eleanor's view of this relationship as the narration switches back and forth between them. This book's incredibly character-driven, so it was right up my alley. I love that the reader gets to know both Park and Eleanor so intimately that it feels like they're real people. The book is set in 1986, but the love story is really timeless. Pop culture, music, and technology references place the reader in the time period. The setting will feel retro to teens and pleasingly familiar to adults, and I think it gives this novel a lot of crossover potential. This is definitely a love story, but it's not what you might think of as a typical romance story. There's a lot of meat to this book. I'd try it on fans of Nick & Norah's Infinite Playlist by Rachel Cohn and David Levithan or The Perks of Being a Wallflower by Stephen Chbosky. The feel of the book is much different from Rowell's adult novel Attachments, but they're both character-driven and both set in time periods that will have 30-somethings reminiscing. Eleanor & Park will be on shelves February 26.